Today I was watching TV with mom and we saw a commercial for the KFC bowl. She asked me if I had ever savored its deliciousness. My mind swirled with vivid flashbacks, eventually leading me to a dark path that I promised myself I would never go down again...a path that saw me logging onto my myspace.com page. I love trips to visit my relatives because when visiting my dad's side of the family I do things I might not do in my everyday life. Some of these things include drinking Busch beer out of can, using the phrase "how are they kin to us? 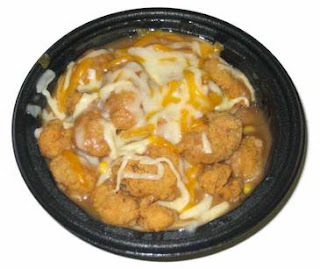 ", eating 3-4 desserts after a given meal and lastly eating the cheesy chicken mashed potato bowl from KFC. The bowl, as I will refer to it, has been a source of wonder for me for several months, but I have yet to give in to its splendor until this late night craving at the Days Inn. If you have been living under a rock for the last 6 months, you may be unfamiliar with it, so I will give you a preview. It is roughly 3 lbs of mashed potatoes, followed by a layer of sweet corn- then a layer of chicken strips- then a layer of gravy and melted cheese that can only be enjoyed via spork. Separately, I love all these elements so I thought, what the hell! First off, it smells wretched so it is probably not best enjoyed in an enclosed space with others (like a car or a Days Inn hotel room) Also, it wasn't very visually appealing as it appeared that the corn was swimming in the gravy. Even still, I had a good experience with it. I don't think I would ever order it again...unless I was heavily sedated, but I could wonder no more. After all, trips to NC are made for gluttony. Perhaps on the way home I will tackle the BK's Meatnormous Omelet sandwich. This makes me want to try that chicken sandwich they have that is a sandwich literally forged from chicken breasts. Know the one?